You’re going shopping for a new dishwasher. A salesman approaches you and tells you about a FANTASTIC new product: the dishwashing car! You can do your dishes while driving your car! Now, because this product is so ground-breaking, there are a few catches. This dishwashing car is very expensive (at least compared to buying a car and a dishwasher separately). The maintenance and repairs of this new technology are also very expensive. And lastly, it doesn’t drive very well for a car. Oh, and it also doesn’t clean dishes very well for a dishwasher. If you think a dish-washing car is a terrible idea, don’t fret. Most people would find the idea of a dishwashing-car ridiculous. Why? Because there is absolutely no reason to combine a dishwasher and a car. You’re much better off buying the two separately. What happens when you buy a permanent life insurance policy instead of simply purchasing your investments and life insurance separately? purchase a permanent life policy. Now, there is no so such company called San Diego Life Insurance. In our litigious society, I can’t name the real life insurance company. But, I’ll let you think about which company I could be referencing. Hint: they sell life insurance and are named after a big city. This post is actually borrowed from an old personal financial planning blog. If you’re interested in getting into the nitty-gritty of the numbers, you can check out the original post here. For the cliff notes, read on. The 20-year difference in a universal life vs. BTID strategy is approzimately $380,000+. Why the startling difference? In the first year of this universal life policy, there is no cash (surrender) value. Why? Because that money pays for the salesperson’s commissions and insurance company fees. In addition, a cap on the benefits further limits the final value of the universal life insurance policy. 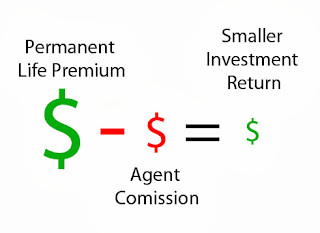 Simple math dictates higher investment returns in the absence of a middleman. For certain ultra high net worth individuals (who have already maxed out every tax-advantaged savings option), a permanent life policy might be the way to go. 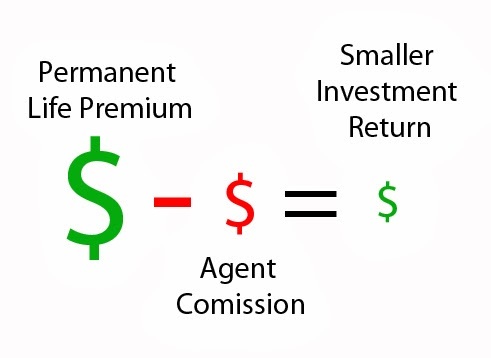 However, for most people, the case study above shows that it makes more sense to purchase your investments and your life insurance separately. Given the data, it is not surprising that many fee-only financial planners advocate for buying a term life policy and then investing separately. So, the next time a salesperson offers you a life insurance policy that allows you to invest money at the same time – make them a counter-offer: see if you can interest them in a dish-washing car.